The TrioBike, Three Devices In One | OhGizmo! By David Ponce on 09/01/05 • Leave a comment! Let’s say you’re one of them people with kids. You have to haul’em around all over the place, and you’re not the SUV type. The TrioBike, a triple function device, could be just the thing for you. This is how it works. It has a detachable pod in the front that can carry up to 80kg. You put the kids in there. Then, you bring em to the, um, well, wherever it is you take kids to. You can leave the pod there and just bike back home. When you go back to get’em, you don’t have to immediately reattach the pod… you can use that as a stroller. 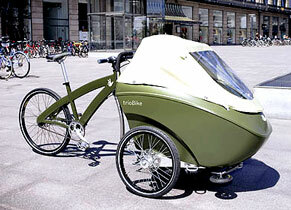 So, you get three devices in one: a bike, a stroller and a… cargo hauler. All this fun for the low low price of $2450. Again, here. Story VIA Treehugger.